Anthony Bryant hijacked a jet to buy bazookas for the Black Panthers. Anthony Bryant took a plane to Cuba to buy bazookas for the Black Panthers. Fidel Castro wasn’t happy to see him. The Story: Particularly during the late 1960s, a large number of American skyjackers earnestly believed that Fidel Castro’s Cuba was an egalitarian, post-racial utopia. They diverted planes to Havana not only as a form of protest against the Vietnam War or Puerto Rico’s lack of political sovereignty, but also because they wished to forge new lives in a country they envisioned as a genuine land of opportunity. Most of these skyjackers were quickly disabused of this fantasy, perhaps none quite as famously as Anthony Bryant. A small-time hoodlum who had spent most of the 1960s at San Quentin State Prison in California, the 30-year-old Bryant claimed that he hijacked Flight 97 under orders from his higher-ups in the Black Panther Party; he said his mission was to arrange for the purchase of bazookas to aid the organization’s struggle against oppression. He used a revolver to commandeer the Boeing 727, and en route to Havana he robbed several passengers. One of his victims, whom Byrant forced to turn over a briefcase containing $1,700 in cash, was a Cuban intelligence operative. Bryant was elated upon landing in Cuba, which he believed to be a promised land. “Cuba was creating a true democracy, a place where everyone was equal, where violence against blacks, injustice and racism were things of the past,” he would later write. “I had come to Cuba to feel freedom at least once.” But Bryant was given the very opposite of a warm welcome: Because he had accidentally robbed a Cuban agent, he was arrested by the G2, Castro’s secret police, and summarily sentenced to 12 years in prison. 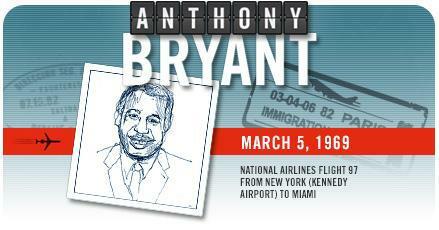 After serving nearly his full sentence, Bryant was allowed to return to the United States in 1980, along with several other American skyjackers who regretted their Cuban adventures. Upon his arrival at a Miami airport, he declared that the U.S. was “the greatest country in the world.” Immediately arrested for air piracy, Bryant had his $500,000 bail posted by Anthony Cuesta, head of the anti-Castro guerrilla group Commandos L.
The Upshot: Bryant pleaded guilty to air piracy in the U.S., but he was sentenced to just five years probation. He became a popular radio host and a sought-after speaker on the right-wing lecture circuit, where he warned that liberal politicians were leading America down the path toward inhuman Marxism. (Watch his conversation with noted conspiracy theorist G. Edward Griffin.) Bryant also became a prominent anti-Castro militant; in 1992 he was arrested for attempting lead a maritime raid on Cuba. (The case was dismissed in 1993.) He died in 1999 at the age of 60.